Last week, we filled all you Nimbus-lovers in on our process of character creation. Just like its inhabitants, Sunnyland didn’t turn into a magical oasis overnight. While we had big dreams for a land with rolling hills, prehistoric volcanos, and hip city streets, those terrains don’t just draw themselves! After many a concept sketch, color study, and polish pass, our backgrounds finally started to feel like the Sunnyland we had been dreaming of. Check out the images below for the different stages Nimbus’ world went through to become the place we know and love (and wished we lived in)! Pumping out some initial BG sketches! Nimbus Brings Home the Gold! 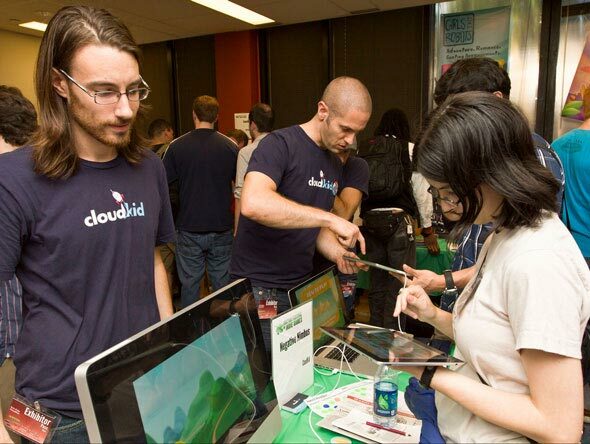 Negative Nimbus made it rain this weekend at the Boston Festival of Indie Games! Nimbus took home the “Awesome Aesthetics” award for best visuals and design of all the games exhibiting. We’re hoping Nimbus doesn’t get a big head from all the attention: he even received the most votes of any winner in each of their respective categories! Aside from the accolades, Nimbus was also overwhelmed with the flood of love from everyone who visited the table. There was a steady stream of traffic the entire day! Players of all ages seemed to really enjoy the game, and Nimbus buttons were a hot commodity at the event. Nimbus was overjoyed with the success and was also relieved that he did not rain on/ruin anyone else’s beloved games. Check out Nimbus’ Facebook page over the next few days for more pictures from the event! Unlike most clouds, Nimbus didn’t just appear out of thin air. In fact, it took a lot of dreams, sketches, and Wacom pen nibs (our version of blood, sweat and tears) to bring Nimbus and his Sunnyland co-habitants to life. 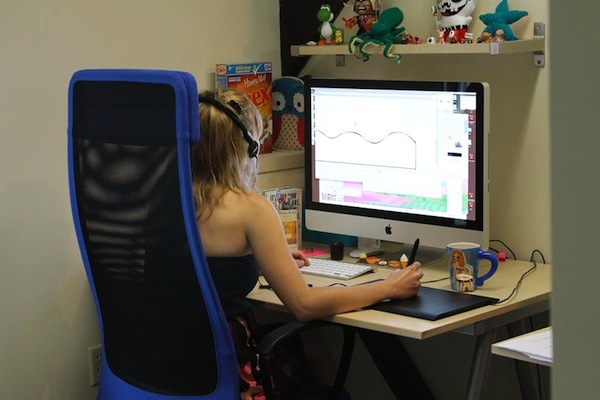 From rough concept designs sprawled on paper to final polished characters ready to animate, our characters go through a number of steps, and talented artists, to become the final versions you’ll see in the game. Click the “more” button below to see some examples of the different stages in our design process. Hope you enjoy! 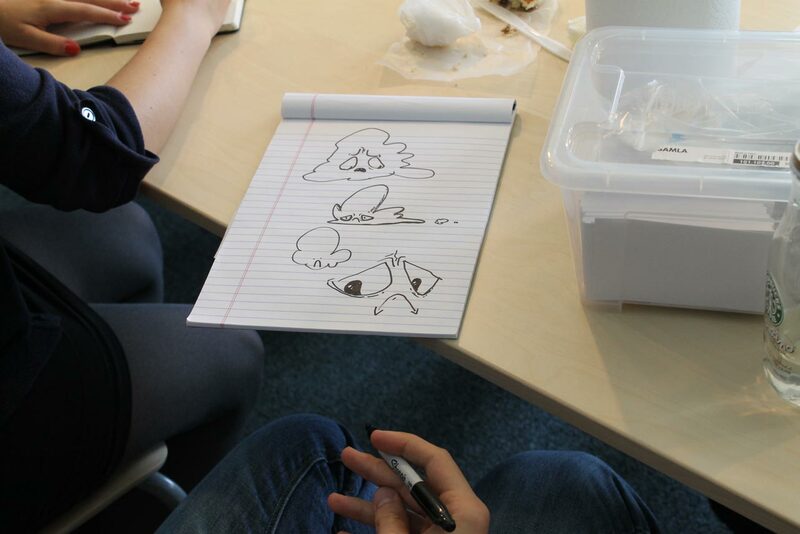 An artist sketching Nimbus concepts during our very first brainstorm. Did you know that Nimbus has his very own facebook page!?! Of course, being his negative self, Nimbus is worried that not a lot of folks will “like” his page (after all, he’s used to his only friends being the flowers and Bill the Umbrella). Since Nimbus can use all the love he can get, please check out his page and show the little guy how much you all like him! Added bonus: Nimbus’ facebook page will be the go-to spot for updates, sneak peeks and info leading up to launch. Happy facebooking! Remember the good old days, when you’d eagerly read the comics in the Sunday morning paper while drinking Sunny D out of a sippy cup? And how your hands and face were completely covered with newspaper ink by the time you were done? Ahh, nostalgia. Well, wipe your wistful tears away because Negative Nimbus will feature comics that are available in game! 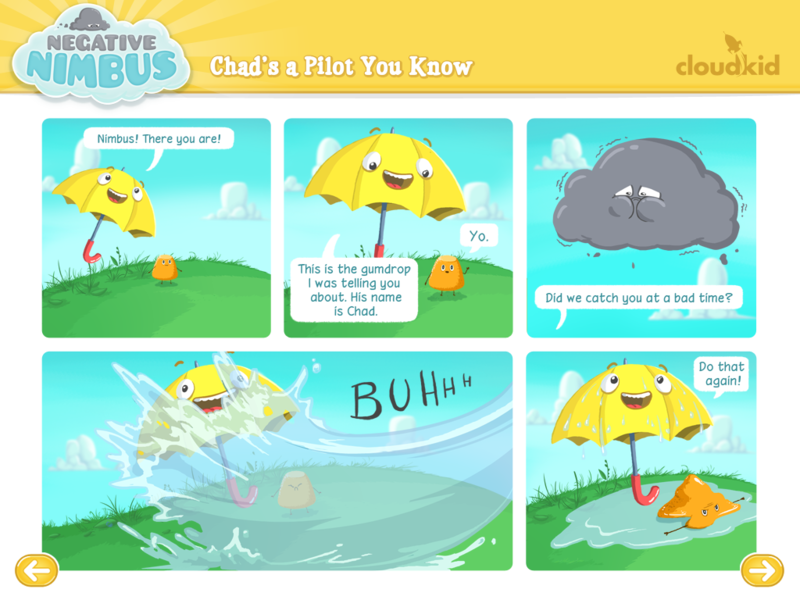 Yup, lil‘ Nimbus has his own comic! Ink free! Check back here to get a taste of some of his cloudy exploits. Hello, and welcome to the world of Negative Nimbus! If you’re reading this, that means you’ve discovered our development blog. Huzzah! To start, we’d like to introduce you to Nimbus: a curmudgeonly rain cloud with a heart of gold. 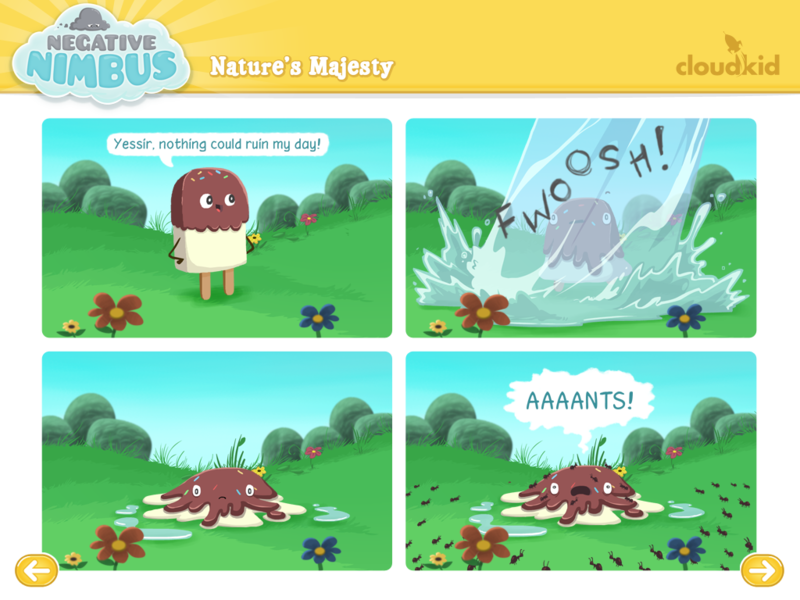 Players will help guide Nimbus through the various worlds of Sunnyland, raining down on all the flowers (they love it!) while trying to keep all of Sunnyland’s other inhabitants dry (they hate rain!). Along the way, you will unlock comics, new accessories and meet all of the friendly folks of Sunnyland. 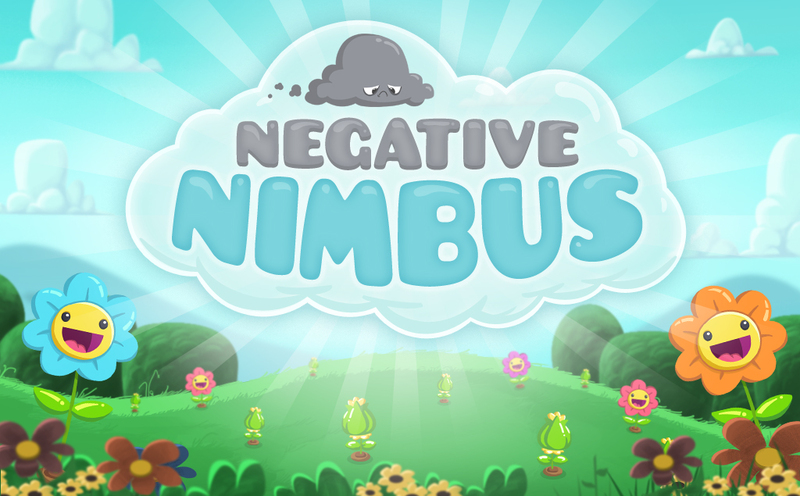 Developed by our super creative artists and programmers at CloudKid, Negative Nimbus is a real labor of love and our first venture in to the iOS landscape. We think things are looking great so far, and we’re so excited to share it with the world. Be sure to check back here often for Negative Nimbus updates, sneak peeks, and an insider’s look at concept art, game development, and Nimbus’ humble beginnings. There’s lots more to come!